Life was going peacefully at the Heffner estate. Babs was still greatly enjoying all luxuries the house had to offer and felt no regrets to have settled down. Babs: ​Hello, precious stones, I'm your mamma now. The living room was definitely Babs' s favourite place. She danced a lot near her favourite gems display, while Andrew read stories to their kids. Bao birthday was coming and he was enjoying his last childhood hours hanging out with his best friend Charlie at the pool. Charlie: What's the first thing you're gonna do when you age up? Bao: Don't know. Grow a beard? Meanwhile Babs baked a strawberry cake for Bao and got all things ready for her son's big moment. At last the moment was here. First teenager of the third generation! He rolled a geek trait. His outfit didn't reflect his geekiness at all and he immediately went to change his clothes and hairstyle. Thankfully he forgot about the beard thing completely. Bao didn't want to share the room with his little brother anymore. As a teenager he wished for more privacy. And that's what his parents granted him. He got the whole top floor to call his own! Good thing they still have those plants Andrew's father cultivated. Otherwise they couldn't have afforded it. Beryl's birthday was coming fast too. She had yet to finish her Artistic Prodigy aspiration. While working on it, she discovered that she genuinely loved playing the piano. 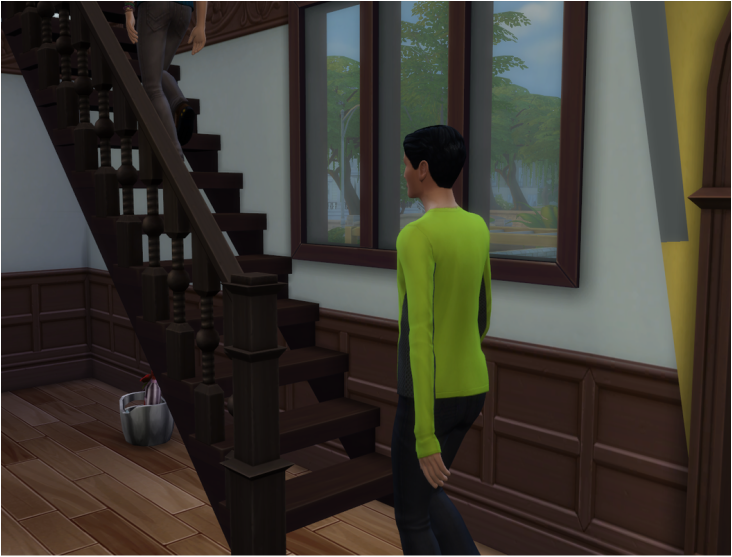 As soon as she completed the aspiration, she ran downstairs to blow out the candles on her birthday cake. She almost didn't make it in time before the spontaneously triggered aging up occured. Almost. She aged up into a beautiful young lady. I think I found my favourite of this generation. She's just too lovely. This is her after a makeover. The Heffner cousins, Paul and Ava, came to the birthday party. They are teenagers already too. Beryl's room needed some remodeling too now. She rolled a creative trait so I let her keep the piano in case she felt like playing or composing. The only child left in the house now was Batyr. And he was pretty angry about it, since he had no one to play with. But he will not stay behind for long. While his sister enjoyed herself playing the piano, Batyr secretly took out his anger on a poor bear toy. So much anger for such a little boy. At last his big day has come! He'll be able to hang out in the park with his siblings, cousins and Charlie. He spinned like a pro and where there was a small boy just a few seconds ago, now a teenager stood in all his glory. I think, he has the cutest face of the three kids. ​I let his features pop up more with a little makeover. Ain't he adorable? Finally he could join the gang in the park and meet new people of his age! The first person he met wasn't actually a teenager. It was Charlie's mother Anette Clark sleeping on the bench. What is she doing here? he thought. It turned out she worked as a painter and came to the park to find inspiration. She invited him to cloudgazing and he wanted to refuse at first, it felt awkward. But she convinced him and to his surprise he enjoyed it. Anette: See? It's a good practice of imagination. You should do it more often. Imagination is useful not only for artists, Batyr. For example a good chef needs some of it too. There would be no inventors without it. Batyr had to admit there might be some truth to it. Next interesting person he met was Vladimir Pancakes. He was looking for someone to play a chess with and Batyr gladly joined him. But he was no match for Vladimir, who was evidently bored during their game. Then this weird man showed up, all angry, accusing Batyr that he had taken his seat. He even started crying! Batyr let him have it, before anything bad could happen. It was getting late anyway, his siblings were nowhere to be seen and he wanted to do his homework and watch a tv for a while before dinner. When he returned home, his parents had a surprise for him. A new private bedroom! It was situated on the second floor of the secondary building, connected with the main one with a walkway. He'll be having the pool just a few steps from his room and will be able to swim couple of rounds every morning before school! This was the best day of his life! The next day wasn't as bright as the day before. Andrew came home from work extremely angry looking for Bao. When he finally found him playing Blickblock on his computer he started yelling at him. "How could you do that?! How could you disgrace our family like this?! Bao gazed at him dumbfounded. "I have no idea what you're talking about, dad." "Come," snapped Andrew and led him into the kitchen and gestured toward the newspaper lying on the table. "This is what I'm talking about!" "How could you possibly explain this? Everything your grandfather worked so hard on, our reputation, everything is ruined! It's all over the Simnet! No one will want to marry you or your siblings after this. Everyone will think we are all insane or something." Babs has never seen her husband so angry. Actually she's never seen him angry at all. He's been always such a happy and cheerful man. She was really worried. And maybe a little bit amused by the newspaper article. Unlike Andrew she was more familiar with the tabloids and paparazzi's work. "Dad, I thought you'd understand more than anyone. You're a glutton too!" "I have never done such a thing, even when your grandfather couldn't pay the bills I never rummaged through the trash. And you are not starving! We have plenty of food in the fridge! Why did you have to do this to all of us?" 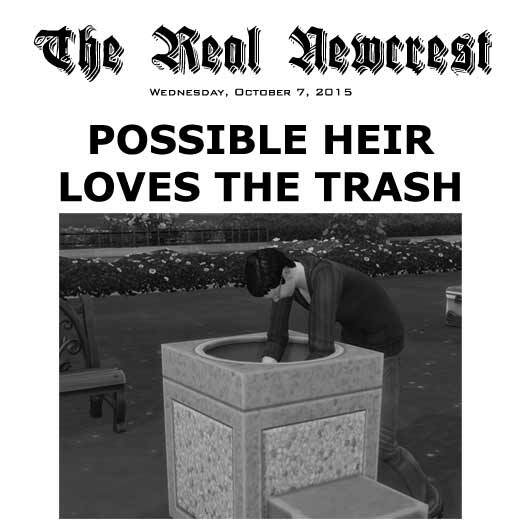 "Honey," interfered Babs addressing her son, "you know we have trash cans too. Couldn't you use one of them when you had those... urges... of yours?" "I have no urges!" Bao snapped. "I'm not insane!" He jumped up and stormed out of the kitchen. ​"You are grounded for... FOREVER!" Andrew yelled after him.